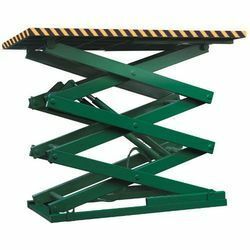 Pioneers in the industry, we offer Scissor Lift Table such as High Rise Scissor Lift Table, Electric Hydraulic Lift Table, Scissor Lift, Industrial Scissor Lift Table, Double Scissor Lift Table, Multi Scissor Lift Table and many more items from India. 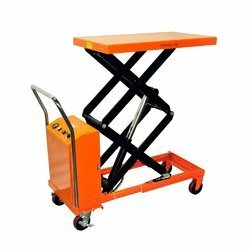 ‘Gujarat’ manufactured Lift tables are among the unassuming forms of mechanical handling equipment. Compact and virtually maintenance free qualities which integrate to give Lift Tables an extraordinary facility for low-cost problem-solving. It is a most resourceful and classy item of handling equipment capable of withstanding the toughest environment. Many safety features have been instilled in the ‘Gujarat’ Lift table. 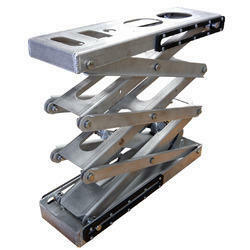 These features include clearance between scissor arms to prevent fatal accidents, sufficient gap between the top and bottom platform when the lift table is at rest, solenoid valves, hose burst valves etc. 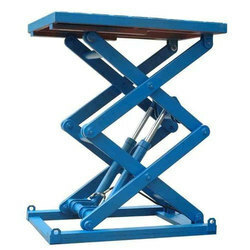 Owing to our wide proficiency, we are manufacturing and supplying various types of Industrial Scissor Lift Table. These lifts are highly durable, excellently finished and smooth operation aspects, thus having extensive uses in industries. Designed by skilled designers and manufactured by using advanced machinery, these lifts are available with us in different stipulations. Clients' can avail these according to their need at affordable price tags. We are specialized firm engaged in manufacturing and supplying High Rise Scissor Lift Table. These lifts are highly durable and stable in design, owing to their production from best quality materials and technology. These lifts are equipped with flow control valve and control panel operation for speed control during raising and lowering of table. We are reckoned as prominent manufacturer and supplier of wide range of Scissor Lift. Our offered lifts are extensively used in industries, owing to their sturdy design and high efficiency. Equipped with the advanced control system, these lifts are user-friendly and require no maintenance at all. We manufacture these lifts in various specifications as per clients' needs and are available to customers at the equitable price range. 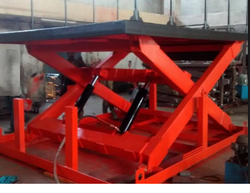 We are the leading manufacturers and suppliers of the Lifting Table. 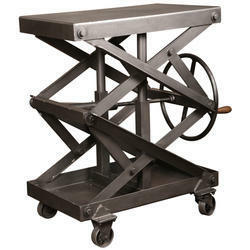 These lift tables are used in above-floor or in- floor pit applications. These have got some standard safety features. Upper platform fitted with a safety bar prevents sliding on contact with obstructions. Platform size can be provided up to 4500 in length to accommodate Forklifts. 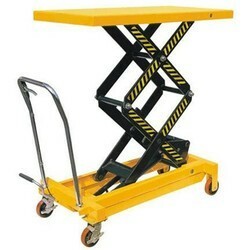 Looking for Scissor Lift Table ?